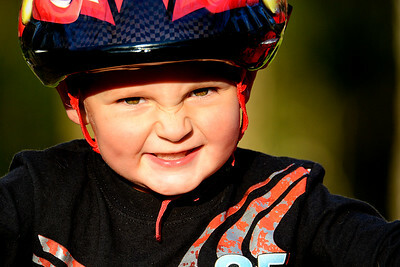 Travis was not as excited about the wildlife as I had hoped, but he had a great time on his bicycle. 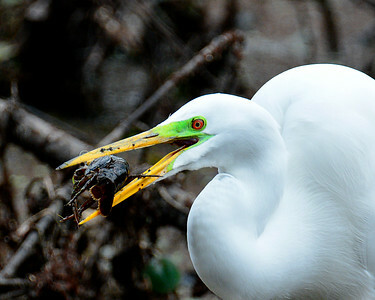 I happened to walk up on this Great Egret having a rather large crawfish for dinner. 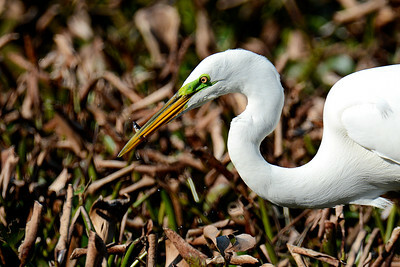 The Egret worked it over pretty good before finally swallowing the whole thing. 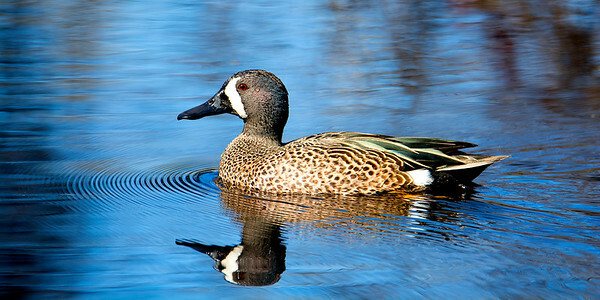 A Blue-Winged Teal swimiming in 40 Acre Lake at Brazos Bend State Park. 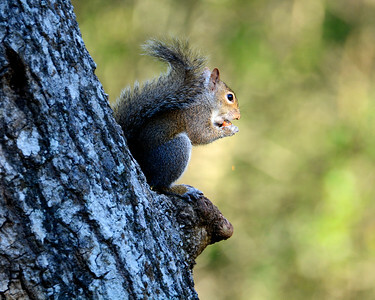 While on and early morning hike with Travis, at Brazos Bend State Park, I came across this little squirrel eating a pecan. There are thousands of these guys in this park, so not very challenging to find one to photograph. The challenge lies in getting one lit properly. When I first started watching him he was completely in shade. But as I waited and watched he moved around until his upper body and head were perfectly lit. 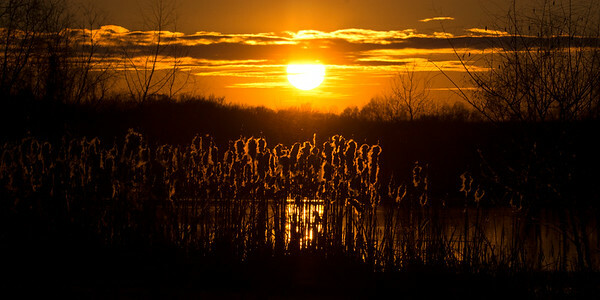 As a Nature photographer, I am always looking for the perfect light. 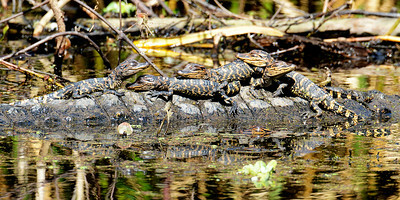 While on our recent visit to Brazos Bend State Park I was excited to find a mother alligator with some of her hatchlings. I think these little guys are about 5 to 6 months old at this point. Since these small gators are vulnerable to attack by predators they will stay within the security of their mom for around two years. We arrived at Brazos Bend State Park and got the RV set up and had just enough for Travis to play for a little while on the playground. I was able to then talk him into a short hike for me, a ride in the wagon for him, in an attempt to see an aligator which we both like. The sun was going down fast so we did not have much time to look around, but we did see one gator swimming, some coots, a gallinule, cormorants, a few white ibis, and some ducks. On the way back to our RV Travis and I witness this beautiful sunset over Elm Lake. 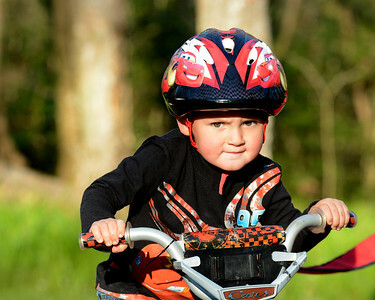 Travis wasn't as interested in the alligators as he was on his first visit to Brazos Bend, but he did have a lot of fun riding his bike. 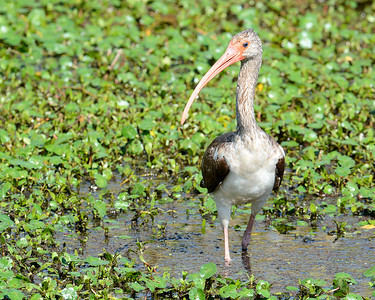 I photographed this young White Ibis searching the marsh for a meal. 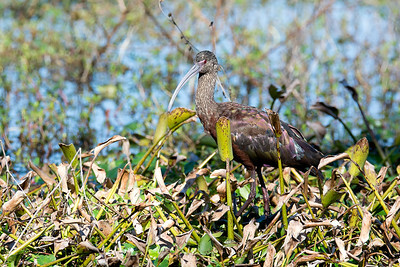 A White-faced Ibis in the marsh at Brazos Bend State Park. I really liked this scene of this young gator sunning itself on a log with the reflection in the water. 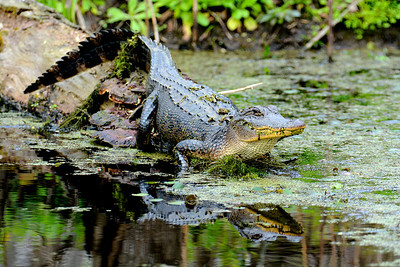 I photographed this image on the Spillway Trail at Brazos Bend State Park. While hiking and exploring Brazos Bend State Park, I watched this Great Egret catch a small snack in the shallow waters of 40 Acre Lake. 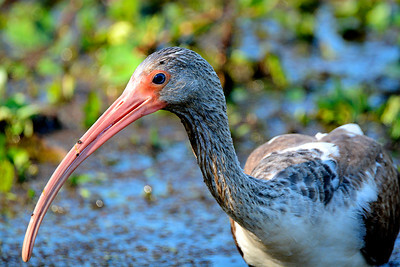 This young White Ibis was searching the marsh for food. 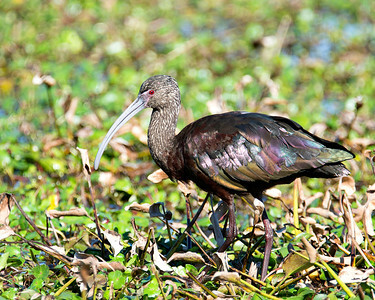 He uses his long beak to probe the mud for his favorite meal, the crayfish. I watched this very intelligent bird, an American Crow, grab a pecan and take it up into this tree where he cracked it open and ate it. 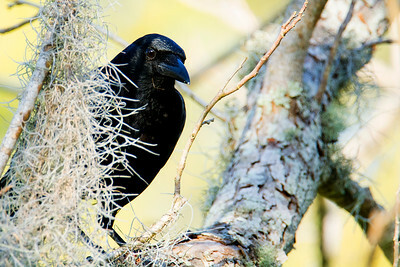 You can see pieces of the pecan at the feet of the crow behind the Spanish Moss. 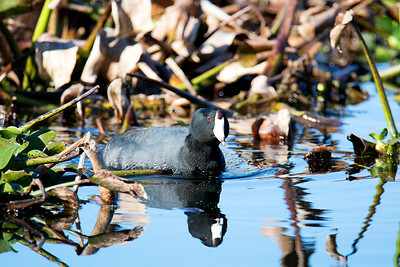 I photographed this American Coot swimming in the shallow waters of 40 Acre lake at Brazos Bend State Park. 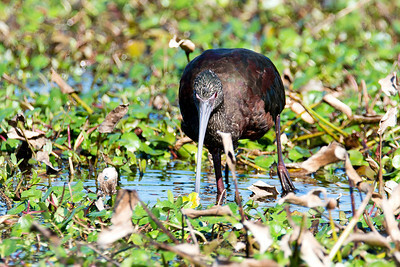 A White-faced Ibis searching the marsh for his favorite meal, crayfish. 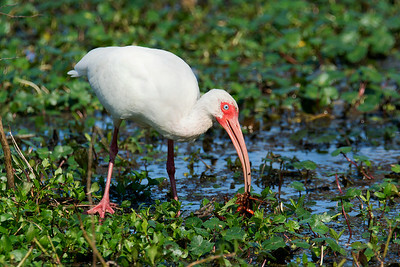 This White Ibis found a nice crayfish meal. 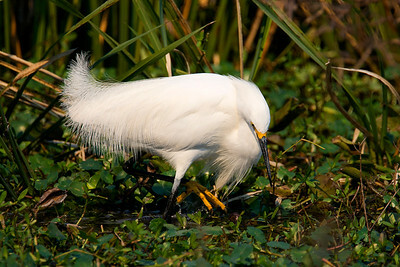 A Snowy Egret uses the big feet to stir up small aquatic animals as it forages for a meal. 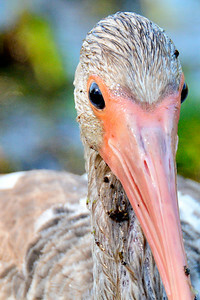 This dirty bird is a juvenile White Ibis that has been swamp diving in search of food. 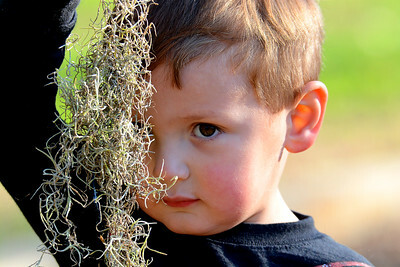 A curious little boy always picks up to inspect and sometimes taste the Spanish Moss. 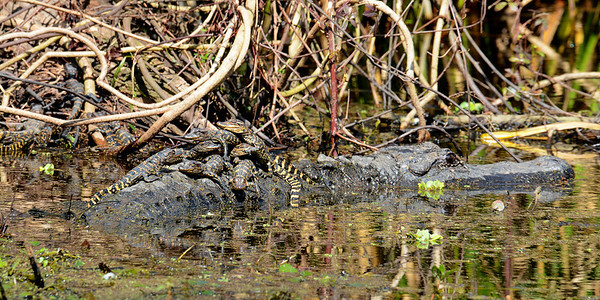 These baby gators are taking it easy on momma's back. 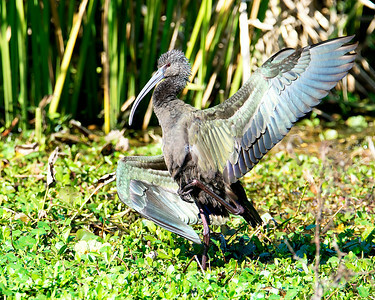 This White-faced Ibis saw the paparazzi and decided to srtike a pose. 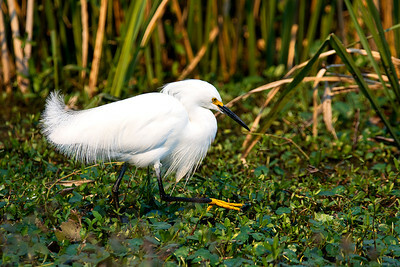 This Snowy Egret is using it's large yellow feet to stir up aquatic animals in the marsh.